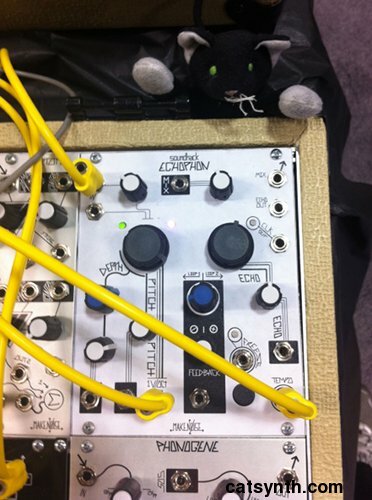 We finally come to the end of our exhaustive visit to the huge analog modular booth at NAMM. We of course had to pay our friends at Synthrotek a visit. They make DIY synthesis kits as well as full modules, often with a delightfully noisy quality. For example there is the aptly named DIRT Filter and the Chaos NAND of which we at CatSynth are quite fond. They had some new offerings for this year’s show. Among the new modules were a series that came from a collaboration with George Mattson. The MST and Synthrotek modules together form a complete analog synthesizer voice, with MIDI-to-CV, oscillator, filter, mixer, and modulations. There is even a classic Mattson-designed buffered multiple. Another interesting offering was the DS-M, a complete drum synth module with multiple “colors” of noise, built in oscillator, VCO and a voltage-based “velocity sensitivity.” It can create standard analog drum sounds, but can also do some rather unusual sounds as well. Like most products from Synthrotek, these can be ordered as raw kits, module-assembly kits (with panels, etc. ), or as completed versions. Nearby was Synthesis Technology, makers of the E-350 Morphing Terrarium that was among the first modules I bought back in 2012. Next to the e350 in the photo is an expander module from Manhattan Analog that opens up some additional functionality of the original module. Also pictured above the the E-102 Quad Temporal Shifter, basically a digital implementation of the Serge analog shift register. The E-560 thru-zero frequency shifter and ring modulator is quite interesting as well. This concludes our reports from this year’s NAMM show. There was so much to see on the synthesizer front we were not able to get to it all, much less write about it. It was definitely one to remember, but we are looking forward to more next year! Here is another improvisation, or perhaps a meditation, on the analog modular synth. Enjoy! This one used most of the modules in the system, including the Metasonix R53, both Make Noise modules, the Morphing Terrarium from Synthesis Technology, the Koma Electronic SVF-201 filter, the Polyvoks filter, and the Noisering from Malekko Heavy Technology, all mixed together via Pittsburgh Modular’s Mixer and Out. The Noisering was in many ways the foundational element for this meditation. Please share your thoughts either in the comment section here or on SoundCloud. Today we look back at my latest performance with Pitta of the Mind at the Luggage Store Gallery in San Francisco, a show that also featured a set by the Mezzacappa-Phillips duo. Pitta of the Mind is my music-and-poetry duo with poet Maw Shein Win. It was our fourth performance as a duo, and probably our most polished to date. As with our previous performance at last year’s Skronkathon, we selected a color as the overarching theme for the set. That time it was silver, this time it was blue, which was reflected in our costumes, props (including a little blue tree), and the content of some of the poems. The selections were a bit darker and melancholy than at the Skronkathon, and overall the set had a more serious feel. There were, however, humorous moments in both words and interpretive dance moves from Maw. For the music behind the poems, I used a variety of iPad apps including Sunrizer, Animoog and Bebot. The challenge was to provide sound that fit with the poems without overpowering them. After the main course of our poetry-and-music set, I played a solo improvisation on the analog modular system as dessert. A subpatch with the E350 Morphing Terrarium from Synthesis Technology, the Make Noise Maths, and the KOMA Eletronik SVF-201 filter formed the foundation, with other modules patched in and out during the course of the performance. I was aiming for noisy rhythmic patterns, and sometimes succeed, while at other times allowed the sound to move in the direction of longer drones or unstable chaos. The set was well received by the small but appreciated audience, and we got quite a few positive comments for both words, music and our coordinated blue outfits. Lisa Mezzacappa and Noah Phillips opened with with a set of improvised music for upright base and guitar, respectively. Both are virtuosic improvisers, and I expected good things from their set. They explored a wide variety of extended techniques, some percussive and some more drone-like, and moving freely between more structured and free-form rhythms. Overall, the timbres, harmonies and textures were quite beautiful and visually evocative. Interestingly, this was not the first time we shared the bill with the Mezzacappa-Phillips duo. We were all together at a show in Oakland in 2011. I’m glad we had the change to perform together again. Today, we at CatSynth have our very own “CatSynth video”. Luna looks on from her favorite beanbag chair as I attempt to operate the newly installed Eurorack modular synth. This particular improvisation features the Metasonix R53, Make Noise Echophon, MOTM E350 Morphing Terrarium, and Circuit Abbey ADSRjr. Two weeks ago I participated in a two-day opening with visual artist Yong Han and performance artist Jacqueline Loundsbury Live Worms Gallery in San Francisco. Together, we created an experience combining sculpture and two-dimensional artwork with music and performance art. The overall show was anchored by Yong Han’s sculptures, paintings and drawings. The sculptures, which range widely in size, use a combination of metal, ceramic, beeswax and other materials. The two dimensional pieces were a combination of ink drawings and paint. There are elements that are common in his work across media, including graceful geometric curves and lines with organic shapes and patterns seamlessly integrated. Indeed, some of the two-dimensional works appear to the shadows of his sculptures. What particularly works for me in these pieces, whether two dimensional or three dimensional, is their simplicity. The lines and curves form repeating patterns and leave empty spaces; and the areas of color are simple and well-deliniated as well. Many of the pieces have a very delicate feel to them, but some of the more recent ones are very densely packed and suggest strength. The basic structural theme of thin metal and curving lines carried over from the visual art to the performance aspects of the event, providing a level of continuity between the two. The first night featured Jacqueline Loundsbury in an improvised performance piece called re:BOUND where she wrapped her body in steel wire bindings. Large rolls of steel wire were placed around the performance space where she stood and visitors were encouraged to participate by taking pieces of wire and wrapping them around her bare body. Throughout this performance, she was quite exposed and accepted the risks of not knowing what participants might do – something taken to much more dangerous extreme by some of the early performance artists in the 1970s. Indeed, the resulting “wrapping” was less of a cocoon and more an overwhelming array of adornments, such as headgear and other decorative elements, some sexually charged. And the whole amalgamation of wire seemed quite heavy and uncomfortable. But she successfully completed the performance and the resulting embodied artwork fit well with the existing sculptural pieces. After extricating herself from the wire, some of the pieces themselves became independent elements (along with the unused wire) for the presentation on the next day. 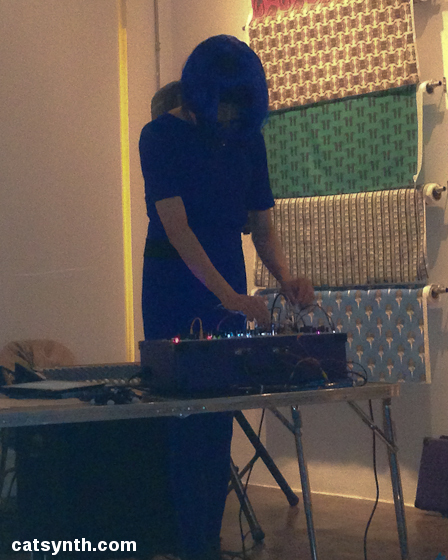 The second evening featured my live improvised electronic music in the space with the artwork and a video projection of Loundsbury’s performance from the previous night. For the set, I used several iPad apps including Animoog, Bebot and iMS-20, along with the Dave Smith Evolver and a couple of newly acquired analog synthesizer modules, the Wiard Anti-Oscillator from Malekko Heavy Industry and the E350 Morphing Terrarium from Synthesis Technology. Overall, I intended the sounds to reflect the wire theme that was present in the sculptures, drawings and the performance, with sounds that were metallic, continuously curving, or otherwise reflecting of the other elements. You can see a short clip below of the video projection and the music-gear setup in action. re: BOUND, with Yong Han, Jacqueline Loundsbury and Amar Chaudhary from CatSynth on Vimeo. The improved music continued for the whole evening, about four hours in all, with breaks for selections from my CD Aquatic. A decent number of people came through the show over the duration, a combination of people who knew advance from announcements as well as some who wandered in from the surrounding North Beach neighborhood and enjoyed the experience. I am glad I was able to participate, and look forward to working with both artists again in the future. This morning we at CatSynth have a sound track for your enjoyment. Last week I was finally able to start putting together my first analog modular system, inspired by my NAMM trip in January. So far I have installed two modules, a Wiard Anti-Oscillator by Malekko Heavy Industry and an E350 Morphing Terrarium by Synthesis Technlogy/MOTM. In this sample, they are modulating one another, with the “X-Y” output of the E350 as the main audio out. I just let Pro Tools run as I was exploring. I expected to stop after a couple of minutes, but found myself quite enrapt. After ten minutes, I decided it was enough for this track and brought it to a close. I was quite happy with the result, and consider it to be a genuine work of improvised music. I hope to start uploading more to Soundcloud and Bandcamp in the coming weeks. I often find myself spending quite a bit of time at the booth of Analog Haven at NAMM. It is an opportunity to see quite a variety of analog instruments (and a few not-quite-analog), and meet several of the small independent makers. The visit took on added significance as I cautiously wade into adding analog modular to my own arsenal of musical instruments. We also had fun with the fact the industrial design, particularly the geometric black-and-white pattern, match my own aesthetics in terms of dress and decor. Make Noise is known for their unique and complex modules for audio processing and control. They had several new offerings, including the Echophon whose sound I quite liked. The Echophon is a collaboration with Tom Erbe of SoundHack, and is a reverse of the usual trend in that digital character is re-imagined in the analog domain. Make Noise also presented their first oscillator, the DPO. Another interesting new find was an analog modular video synthesizer from LZX Industries. I did specifically ask about mixing audio modules with the video modules (LZX uses the standard Eurorack format), and was informed that yes, this can be done, though one would need to match the voltages between the two domains, and keep in mind that the frequency ranges of video are much higher. Visual interest and catchy names are a big part of the inspiration in many of the small boutique offerings. These pedals from Audible Disease were quite creative. Among the visual designs, this simple switcher caught my attention. It reminded me a bit of my visit to the Communist Propaganda Museum in Shanghai. Other offerings included the ARCHANGEL, an analog sequencer with touch plate controllers, from Detachment 3. The Goatkeeper 3 is a tremolo pedal with analog signal path, but with a variety of waveforms (including the ability to record your own), and a sequencer for even more complex modulation. There was a lot more at the booth, more than I can do in one article. I hope to see more of these instrument makers as I personally explore analog synthesis in greater depth.